On Dec. 22nd my family and I and Kayla's friend, Molly Brown, headed for Florida. We stopped in Springfield for breakfast then Chattanooga, TN where we spent the night. We ate supper at Sticky Fingers, a BBQ place, and went to the mall shopping. Dec. 23rd: We were up and on the road by 6:30 a.m. then stopped in Georgia to visit with Kayla's Grandma Marilyn. We finally made it to Daytona, Florida and we were so excited just to get out of the truck and stretch. We stayed in a resort right on the beach. The people working in the resort were so nice and knew you by name only after meeting you one time. It was so nice to be able to go out the back door and walk out onto the beach. It was amazing. Dec 24th: We shopped in the souvenir shops and ate at Bubba Gumps on Christmas Eve. Dec 25th: We had taken a little tree and stockings with us and put them up in our room so that on Christmas morning we had a few presents to unwrap but, first we went to IHOP to have our Christmas morning pancakes. We spent the afternoon on the beach playing VB in the sand, making sand castles, playing in the ocean, and me getting buried in the sand by Gary, Kayla and Molly. Nothing like being on the beach in your swim suits on Christmas Day. That evening, since it was Christmas and not much of anything else to do, we played a game of mini golf. It was beautiful out. Dec 26th: We visited the Daytona 500 track, and wow, what an amazing place. My dad always wanted to go there to watch the Daytona 500 race but never got a chance, so "Here's to you dad!" Gary wanted so badly to drive one of the race cars and mom wanted to ride in one but they didn't have any openings until late afternoon. By then we were headed for Orlando. We made one more stop at the Harley store. We were told it's the biggest one there is. Two floors of nothing but Harleys and more Harleys. Gary was in dreamland. That evening my Uncle Dennis and Aunt Cheri from Valrico, came and we went for supper and had a wonderful visit. Dec 27th: We spent at Sea World for the afternoon. Shamu and his friends gave a wonderful performance and we saw otter and his friends put on a Christmas performance. The mime was hilarious and the show was cute. Dec 28th: Magic Kingdom for the day and night. My mom and I took Kayla when she was 4 but she didn't remember much of it so we thought we would go back again. Molly and Kayla looked great in their Minnie Mouse ears and many pictures were taken. We got there in time for the parade and had wonderful seats along the curb. It was a lot of walking the whole day and we still didn't get to see everything. The castle at night is so beautiful and the night time parade is amazing. Dec 29th: We took the girls to the mall and shopped for a few hours. It was crazy with people, it was so packed. We drug them away to a flea market. 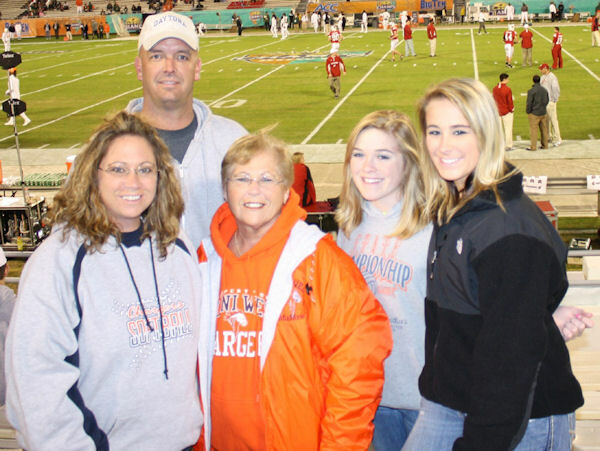 That night we had tickets to the Champs Sports Bowl with Miami against Wisconsin. We had tickets right behind Wisconsin up about 12 rows from the field on the 40 yard line. Wisconsin won 17-14. After the game we drove to Clearwater Beach to spend the evening with one of Gary's buddies he was stationed with back in the 90's. We arrived at his place around 1:00 a.m.
Dec 30th: We visited my aunt and uncle one more time before heading up to Georgia and had a wonderful time at their place. We didn't want to leave. We arrived in Ludowici, GA at Gary's buddy's house that he was stationed in Iraq with and went out for supper and back to their place for a night of Guitar Hero, visiting, and laughs. The next morning Dec. 31st after they fixed us breakfast, we left. That evening we stopped around Nashville, TX to spend the night. Our hotel was only 4 months old and the rooms were huge including the bathroom. We were all amazed at the size of it. New Year's Day, Jan. 1 2010 we headed home to Illinois, to the cold. I was not happy about that at all. Not after having temperatures at 60 and 70, but it was a wonderful trip and we all had a great time with many laughs and memories we'll cherish.